So your body may not have been in top-notch condition for spring break, but there’s still time to get that bikini bod by summertime! For us foodies who dream, live, and eat food all the time, we might be quick to shake our heads at such a statement. I may not have the complete solution to the bikini body challenge we all might face, but I do have one tip that will go a long way. My secret? Chilled soups. If you’re not convinced that cold soup is appetizing, I dare you to try one of these recipe ideas (all of which are packed with fruits and veggies that are in season for spring!). Eating chilled soup is a refreshing way to cool off in the spring and sneak in those fruits and veggies. Think you’ll grow tired of cold soup? Try a different colored soup each day! That way, you’ll be sure to take in all different kinds of vitamins and nutrients. Or better yet, invent your own chilled soup recipe. Out with the warm and in with the chilled! 1. Healthy Yogurt Bases. If you’re like me, you often find yourself craving a bowl of New England clam chowder. But what if I told you that you could still have your bowl of heavenly creaminess without the added fat and cholesterol from heavy cream and sour cream bases? Behold the power of plain yogurt, Greek yogurt and kefir! Vibrant Carrot Soup with Yogurt and Tarragon and zingy Blueberry Lemon Soup include plain yogurt for its live cultures, calcium and protein. Looking for a creamier texture with even more protein? This Persian Yogurt Soup uses Greek yogurt as a creamy base to compliment the fresh herbs and vegetables. For a creamy and tangy soup base, try using kefir for added probiotics in soups like Beet Soup with Cucumbers, Dill and Egg. 2. Healthy “Butter” Bases. Ok, so I lied a little. We all know there’s no way butter can be healthy. But what about nut butters? Healthy nut butters like almond butter and cashew butter can also add a creamy texture to chilled soups. Try this tart Strawberry Almond Butter Soup for a soup packed with protein, fiber, monounsaturated fats, and micronutrients. Or, if you’re really looking forward to summer, try a tropical Piña Colada Soup, naturally sweetened by heart-healthy cashew butter. 3. Healthy Milk Bases. Another way to incorporate healthy, creamy textures into chilled soups is through the use of dairy-free milks like almond milk and coconut milk. Try farm-fresh Corn and Coconut Soup with a kick of jalapeño, velvety Golden Beet & Ginger Soup, or this beautifully green Asparagus and Basil Soup. 4. Seafood Toppings. Adding crab or shrimp to any chilled soup brings a whole new dimension of texture and flavor. 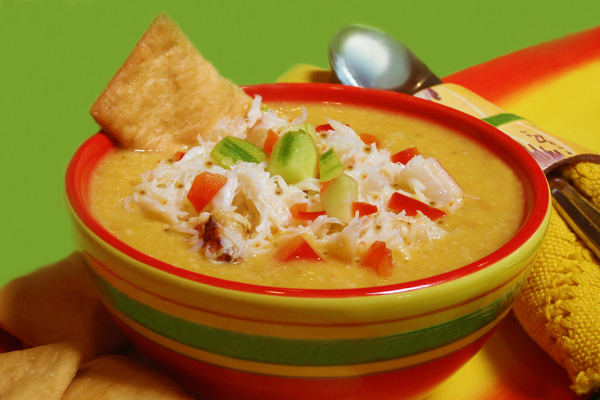 Refreshing Mango Crab Gazpacho Soup (photographed above) uses crab, which is packed with omega 3′s, to compliment the sweet and tangy mango and red bell pepper flavors. Avocado Soup with Sweet Corn, one of my all-time favorite chilled soups, can be topped with seared chipotle shrimp for added protein. Or, if you’re not a fan of seafood at all, both of these healthy soups taste wonderful on their own! 5. Spring Garden Veggies. And what would a chilled Spring soup be without some garden veggies? This BLT Soup creatively transforms the classic sandwich into a spicy vegetable soup. If you can get your hands on some purple cauliflower, try this colorful Purple Cauliflower Soup. Brynn Cahalan, a fan of sneaking in veggies wherever she can, looks forward to getting that bikini bod by the time she graduates from UC Irvine in June. Chilled soups! Yum! I should pass this along to Dr. Oz. Lately he was reporting that regular smoothies increase the waistline, but hey, what if you have a chilled soup smoothie, particularly the “butter” based soups! My mouth is watering already. Great article. Great ideas. As usual, your photos are fantastic. Nice work. Sounds Good. I might make this later this weekend for my friends from class. They’ll love it.